A second-round tumble ended the medal hopes of American Emily Cook, who finished eighth. KRASNAYA POLYANA, Russia — Lydia Lassila already has a gold medal sitting back home in Australia. At these Olympics, she was looking for something better. So she raised her hand and took off down the biggest ramp on the aerials course Friday night for a jump that would cement her as her sport’s foremost trail-blazer regardless of whether it earned her another gold or not. She bounded off the ramp, flew six stories high, and packed four twists inside of three flips. In a training run a day earlier, she had become the first woman to land that jump on snow. In the final, she bowed backward on the landing and her hands spiked against the landing hill. The 32-year-old from Melbourne settled for a bronze medal but did her sport a favor — make that two favors. She raised the bar for the next generation of jumpers, while clearing the way for another of the grand veterans of the game, Alla Tsuper of Belarus, to win the gold medal in her fifth and final try at the Games. Xu Mengtao also bobbled backward during her landing and settled for silver, giving the Chinese women their world-leading fifth Olympic medal in this daredevil sport. None of them are gold, however. American Emily Cook, 34, who was born in Belmont, Mass., and now lives in Park City, Utah, took a spill in the second round, ending her quest for an Olympic medal. Despite Cook’s disappointment, her eighth-place finish was the best of her 15-year career. She said afterward that this will be her final Olympic appearance. The six-time US champion, who has competed in two other Olympics, was ranked second in the World Cup aerial standings coming into Sochi, but she never medaled at the Winter Games. She finished 11th in aerials in 2010 and 19th in 2006. Cook scored an 82.27 on her first jump to advance to the second round, sitting in fifth place before attempting the full-double full jump again in the second round. But she was unable to stick her landing on the second jump, scoring a 64.50 that would have required quite a bit of help for her to advance to the third and final round. The 34-year-old Tsuper was the only skier of the four in the super final to land her jump cleanly. At the last Olympics, she competed for Ukraine and finished eighth after winning the qualifying round — another disappointment for a woman who had been favored to medal in the three Olympics before that but had always come up empty. The victory gave her new country, Belarus, its third gold medal of the Olympics. It was an American, the late Jeret ‘‘Speedy’’ Peterson, who became the most notable boundary pusher on the men’s side of this sport, consistently throwing caution to the wind and throwing his Hurricane jump — five twists inside of three somersaults — before finally being rewarded for it by winning a silver medal in 2010. The women’s side has been looking for that sort of push. Li Nina won silver four years ago with a four-twisting double flip and attempted the same jump in the final Friday. Going first, she wiped out wildly and scored a 46.02. 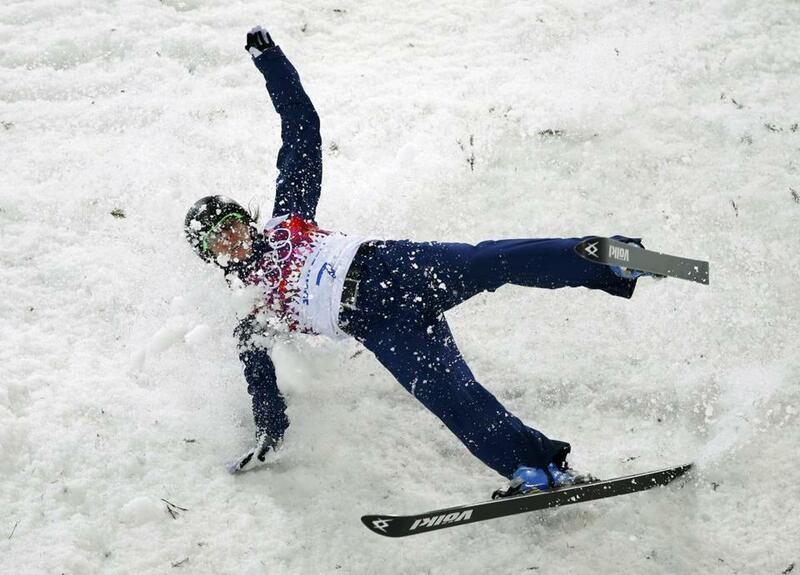 That gave Lassila a better chance of winning the gold even without trying her most difficult jump. But that decision had already been made. ‘‘It was all or nothing for us,’’ she said. The jump looked good in the air, the green stripes sewed onto the inside of her arms and the outside of her pant legs lining up in almost perfect symmetry — an easy way for the judges to see that she was ‘‘penciling’’ the jump. But in aerials, the jump counts for 50 percent, while the takeoff counts for 20 and the landing is the rest. Lasilla wiped out. American Ashley Caldwell, who finished 10th after leading the way in qualifying, agreed.